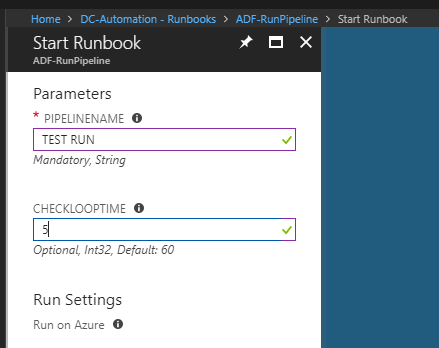 Azure Automation is just a PowerShell and python running platform in the cloud. It has something that is called “a feature” – Fair Share – which basically prevent you from running scripts longer than 3 hours. Well, at least it will pause your script after 3 hours. And if you didn’t implement it as a workflow with some checkpoints – it will RESTART your script from the beginning. The workaround is to connect your own machine (server or laptop) as a hybrid worker. 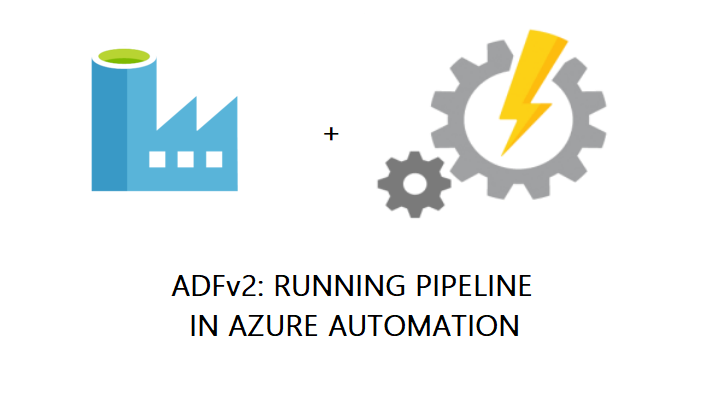 Since Azure Data Factory cannot just simply pause and resume activity, we have to assume that pipeline will not run more than 3 hours. Before we create runbook, we must set credential and some variables. Add a credential. It must be an account with privileges to run and monitor a pipeline in ADF. I will name it “AzureDataFactoryUser”. Set login and password. We will use variables to parametrize some account information just not to hardcode them in our script. Add four string variables and set values for them. First will point to the credential name, second will provide data factory name, third – resource group name and fourth – ADF`s subscription id. You have to add powershell module to your automation account. Justo go to Modules, click “Browse gallery” and search for “AzureRM.DataFactoryV2“. Select it from the results list and click “Import“. Now we can create a PowerShell runbook. Bear in mind, that working with PowerShell in Azure Portal is not the best way to create, debug and test your runbooks. I really suggest using PowerShell ISE addon for Azure Automation. Go to https://azure.microsoft.com/en-us/blog/announcing-azure-automation-powershell-ise-add-on/ and see for yourself. We will use quick create, so select “Create a new runbook“, then name it and select type as “PowerShell“. Use the script below in “Edit” mode, then save it and publish. Invoke-AzureRmDataFactoryV2Pipeline is a cmdlet which I use to trigger a pipeline. Unfortunately, it is an asynchronous operation, so after triggering, we have to periodically check for running state and status. This script will do it in a simple loop and there will be some wait logic before every iteration. You can parametrize the number of seconds. Every loop also prints out last known pipeline status and timestamp of that check. Any status other than “Succeeded” will be treated as a failure. 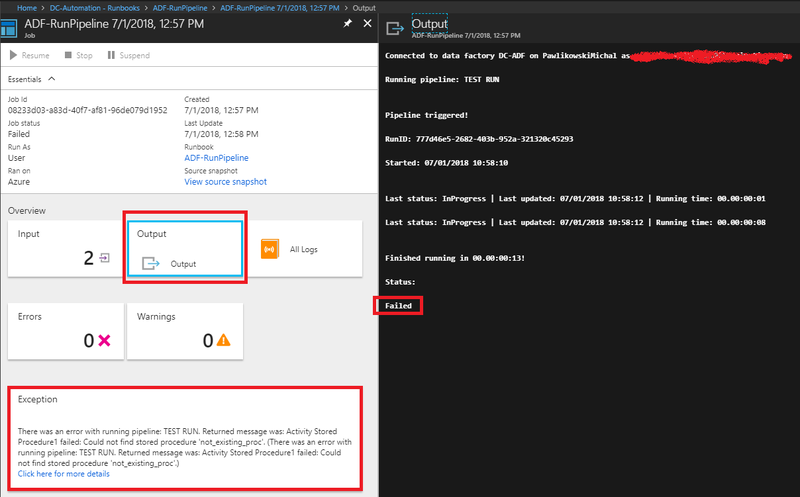 Write-Output "Connected to data factory $DataFactoryName on $ResourceGroupName as $($AzureDataFactoryUser.UserName)"
Write-Output "`nFinished running in $($sw.Elapsed.ToString('dd\.hh\:mm\:ss'))!" throw "There was an error with running pipeline: $($RunInfo.PipelineName). Returned message was:`n$($RunInfo.Message)"
Go to saved runbook, click “Start“. Runbook will be queued. Go to Output and wait for results. Azure Data Factory V2 – Incremental loading with configuration stored in a table – Complete solution, step by step. This blog, all entries, pages and comments published on it, are my views and are not in any way the point of view of my employers.